Seven performers jog on stage. They are dressed in t shirts and shorts, the stage is bare but for stripped-back lighting. They line up, and look at each other, catching eyes and smiling. Their bond is obvious. Then, they run forwards. 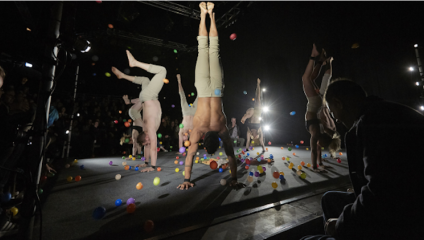 The clear camaraderie between the performers is the basis of A Simple Space, a show by circus collective Gravity & Other Myths that is kicking off 2019's Underbelly Festival. In this very first act, all the performers run amok on the stage, shouting ‘FALLING’ at intervals and toppling over backwards for their stagemates to catch them. And they – almost – always are caught. This high-stakes drama-game version of a trust exercise sets the cheeky, fun, warm tone for the rest of the night. That’s not to say you won’t be holding your hands over mouth and squeezing your eyes shut at times. This is high-quality acrobatics, and there are plenty of incredible bodily feats and high-flying, sharp-breathing moments, but it’s the convivial atmosphere that does it. The performers are funny and engaging – a knowing side smile, a shrug when a stunt goes a little wrong. This closeness and vulnerability is what makes the show successful – you can hear every breath, see the forehead sweat. Most of the time is taken up with acrobatic acts, but the brief clowning interludes are very well done. At one point, all the performers rush on stage to create balloon animals behind their backs, at another, one of the performers solves a Rubik’s Cube while standing on his head – and all this without deferring to cheesiness, to the style seen in so many ‘modern’ circuses that can only really be described as ‘naff’. This is helped by the subversion of several tropes. It is the male performers who strip off, it is the female performers who pick out audience members to be carried for a strength competition. And gender doesn’t matter when it comes to taking roles in tricks: taller and stronger carry and lift, smaller and lighter fly. There’s also a fantastic interlude from the drummer who provides the percussive background music. He stands on stage, shirt off, and creates an impressive soundscape using just his body. He slaps his thighs, his chest, his face. It’s a great twist on the usual demonstrations of endurance, strength and dexterity in circus shows. There are also some glorious moments of audience participation, including one involving plastic balls (no spoilers, but it’s great fun and a visual treat). Fresh, contemporary circus is a descriptor that is bandied about for almost all shows involving acrobatics or clowning, but this is one instance in which it really stands up. This is a modern, highly entertaining show that will certainly leave you smiling.